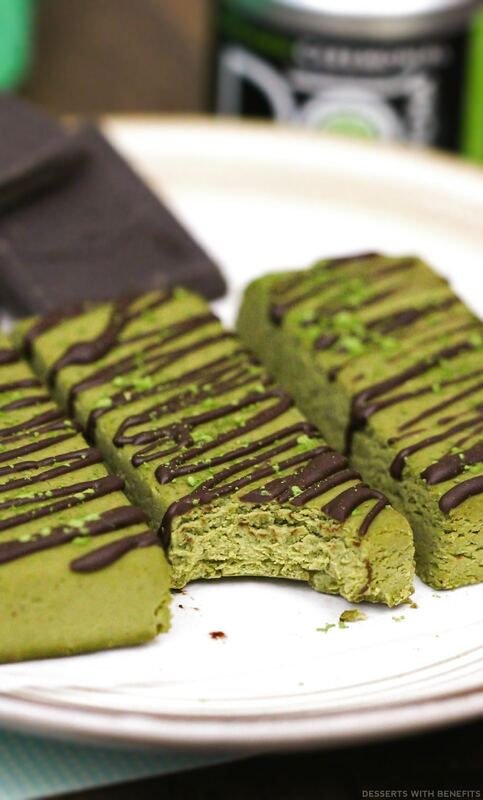 These Healthy Matcha Green Tea Fudge DIY Protein Bars will CHANGE. YOUR. LIFE. I know a green protein bar is a weird concept to wrap our heads around, let alone eat… but you gotta admit, they’re pretty fascinating, yes? Once you think about it, people eat green foods all the time! Green Lucky Charm marshmallows, green Fruit Loops, pistachio bundt cakes, Granny Smith apples, kiwis, etc. Matcha ain’t so weird after all. Let’s have a moment of silence to embrace this beautiful chocolate drizzle. A generous drizzling of chocolate can (and will) make anything taste better. I must admit, I’m not the biggest fan of matcha flavor, but I will GOBBLE. THESE. UP. 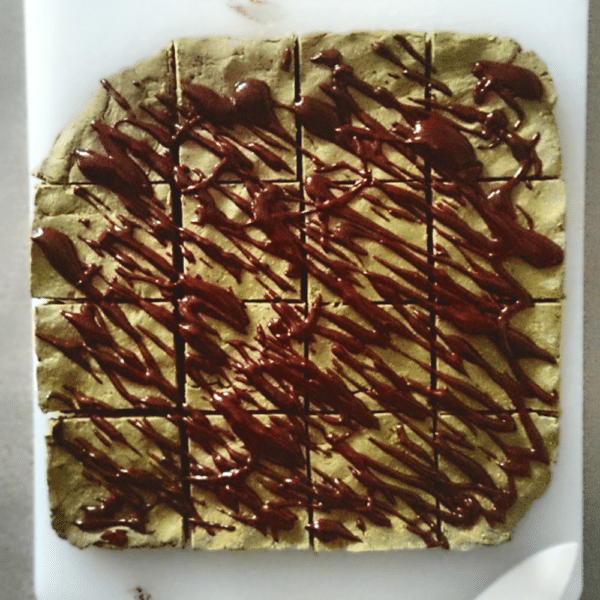 These Matcha Green Tea Fudge DIY Protein Bars are healthy, fun to make, and easy to eat. There are so many health benefits to green tea and matcha, I love finding new ways to incorporate them into my diet (I’m not a huge tea-drinker… my heart belongs to iced coffee). A few bonuses: these protein bars are surprisingly filling, super easy to make, and 100% nutritious! And they’re naturally green too. No artificial food coloring here! "Whoa whoa WHOA. 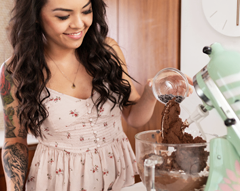 Wait a second… Why is there something GREEN in your stand mixer?" 😳 Any guesses? 😜 Hint: 🍵+🍫+💪=_______! 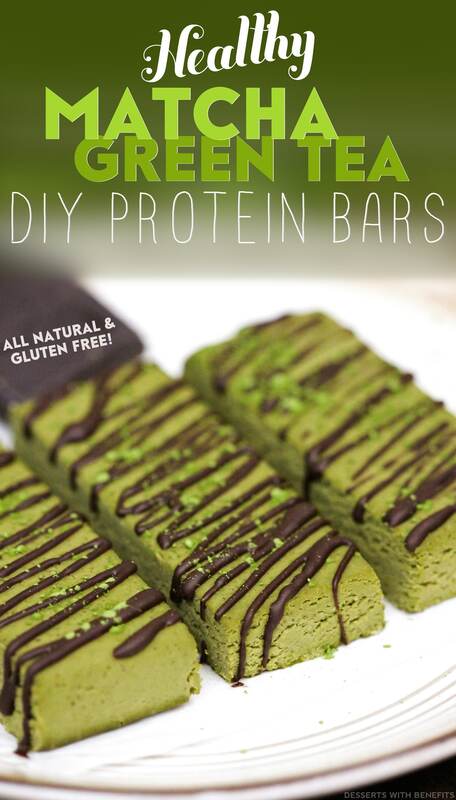 These Matcha Green Tea DIY Protein Bars have all the nice stuff. Just good and wholesome organic, natural ingredients that are good for the body. No need for the high-fructose corn syrup, artificial flavorings, synthetic food dyes, or preservatives. They’re so damn good and will make your taste buds happy as can be. 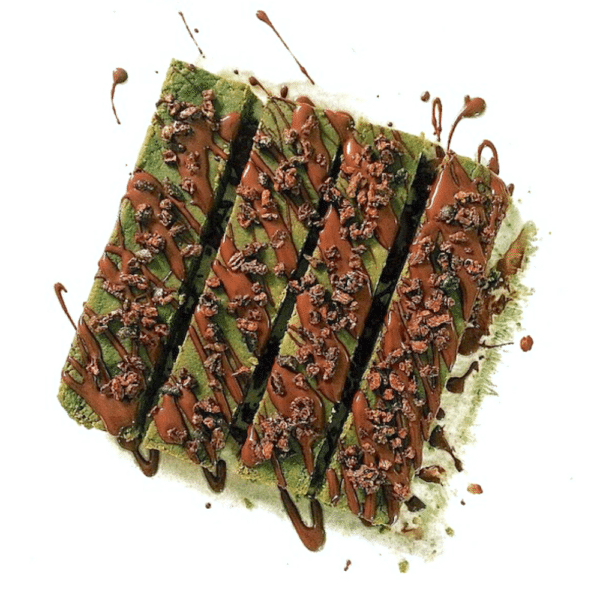 These Matcha Green Tea Protein Bars are unique, sophisticated, and sweet. They're also packed with protein, healthy fats, complex carbs, fiber, and all natural goodness! Line an 8x8” brownie pan with parchment paper. Set aside. In an electric stand mixer bowl fitted with a beater attachment, add all of the ingredients except. Mix on low speed until everything is fully incorporated. Scrape down the sides of the bowl. Mix on medium speed for one last mix. Mixture should be thick and fudgy, like cookie dough. Scoop the mixture into the brownie pan and flatten it out. Tightly cover the pan with plastic wrap and refrigerate overnight. Lift the mixture out of the pan. Slice into 12 bars. Feel free to drizzle melted white, milk, or dark chocolate over the bars! Individually wrap the protein bars in plastic sandwich baggies. Store in the refrigerator for up to 1 week or stash them in the freezer. 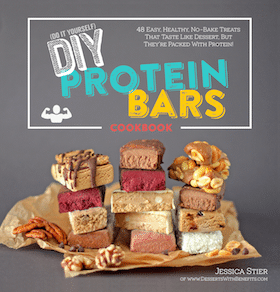 I originally wasn't going to share the recipe here because I worked so incredibly hard on publishing The DIY Protein Bars Cookbook. But I wanted to provide it here because that way, you can determine whether or not the rest of the cookbook is for you! I am so blessed to be a part of such a loving, adoring, and supportive online community. 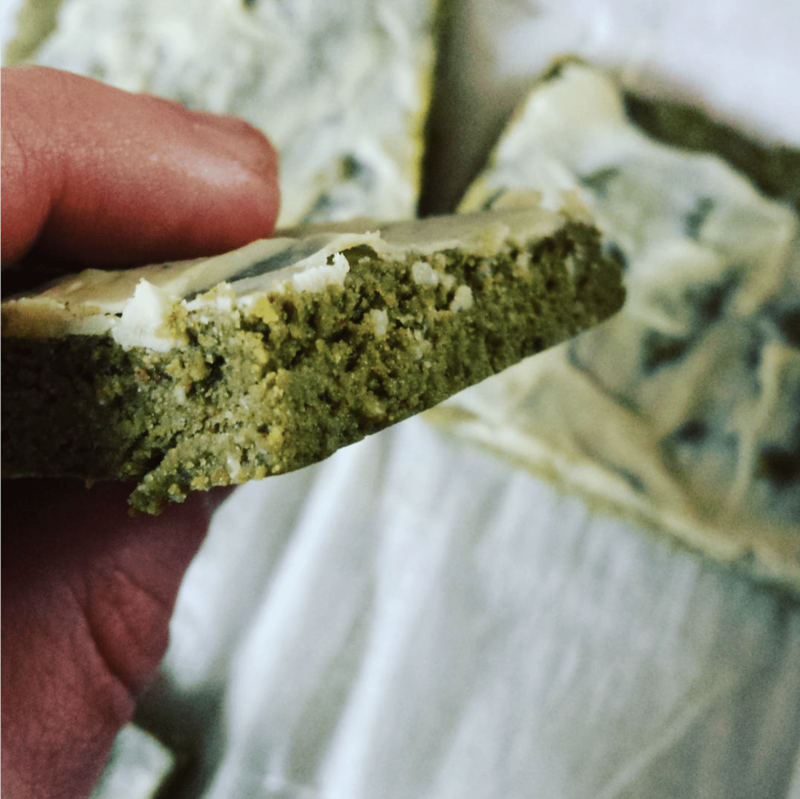 Here are some of the pictures readers have shared with me on social media and via email of their Matcha Green Tea Protein Bar remakes! They look absolutely addicting)) Jessica, how do you think, is it possible to substitute almond butter with smth else? Or they won’t hold together in this case? Aww thanks!! You can substitute the almond butter with any nut butter you like, such as walnut butter, cashew butter, macadamia butter, etc. Any nut butter will work (except peanut butter, because the flavor will overpower the matcha), but for the best flavor, I recommend using roasted over raw. any way to make this without grain and upping the protein still? do you think more protein powder would work? or maybe some almond flour? i just bought some matcha tea too! mind-reader! You can try using other flours to replace the oat flour. I haven’t tried it, but I think almond flour might work! As long as the mixture looks like the dough in the Instagram pic it should be perfect. Hope you like the recipe! Are protein powders interchangeable? I have vanilla and chocolate whey protein and plain egg white protein. Do you think any of these would work in this recipe? Like Zosia said above, whey protein powder and egg protein powder cannot replace the brown rice flour. I’ve tried it SOOO many times but every batch ends up being a total failure. It gets really gooey and sticky and just plain weird! 🙁 I think the brown rice protein powder works because of the fiber content, which helps bind the mixture. I have made some of her protein bars and the ones I have found that worked are only vegan protein powders, so brown rice, hemp, a mix (so SunWarrior blend or Vega), which include pea, cranberry, rice, hemp proteins. Good to know that hemp works as well since that is generally what I have on hand. You don’t think I’ll have to adjust it at all, do you? You honestly make the best recipes! Everything you post looks incredible! I just found your website and love so many of your recipes! This one looks delicious! I was wondering if the brown rice protein powder is a complete protein? Also, I’m allergic to tree nuts, is there anything besides another nut butter that I could sub for the almond butter? Hopefully I’ll be able to try these matcha bars! Thanks! YAY I’m so glad you found my blog too! And yes, the brown rice protein is a complete protein. ~ I definately want to try this recipe! I am not a big fan of Stevia, do you have another suggestion for sweetening these? I wouldn’t recommend liquid sweeteners, like honey or agave, because they will make the dough to moist and the bars won’t hold together. Hope you like the protein bars!! 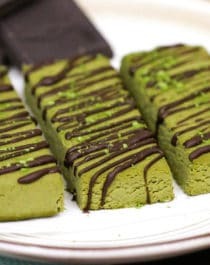 THANKS for this recipe, these bars look so delicious, loved the color that the matcha gives them. I just found this blog, and IT IS AMAZING!! I want to try so many recipes, but a lot of the ingredients I cannot find where I am living. What other things can I replace for these ingredients: Stevia Extract and Oat Flour. I have protein powder without whey, would that be okay to use? I hope this helps. If you try out the recipe I hope you LOVE it!! I hope you like the recipe(s)!! Oh I forgot to add, how long can you keep these out? Do they go bad quickly? I would love to make a big batch once I perfected the recipe but I don’t want it to go to waste if it spoils quickly. They can stay out for a couple hours before they get a little too soft and fudgy. It’s best to eat them straight from the fridge. You could also freeze each individual bar wrapped in plastic wrap or a sandwich baggie and take them out a few hours before eating. Hi. I thought I followed the recipe and when I pulled out my pan this morning..it was mush and didn’t solidify..did I do something wrong? Also my mix before putting into the pan didn’t look nearly as thick as yours did. I left out the stevia and used whole wheat flour instead or oat flour..was that wrong? Pls help! I really was looking forward to these and thought it was super simple. Whole wheat flour should work just fine in place of the oat flour (it’ll just taste a little different). Did you use whey protein? Whey, casein and egg white protein powders don’t work in this recipe. Two more questions… How much is a scoop? And can I still omit the stevia? And add equal amounts of honey to replace it? I’m not sure how much one scoop is, but 168g/8 scoops should be 1+1/4 cups lightly packed. I wouldn’t recommend omitting the stevia because they will be bland and slightly bitter (matcha is very bitter alone!). The stevia in the recipe has the sweetness of ~1 cup of sugar, so you’d probably need ~3/4 cup of honey to add the same amount of sweetness. However, the honey will add too much moisture/liquid to the recipe and the bars won’t solidify. I know others have asked about the appropriate type of protein powder, but mine is a bit different. I do NOT have whey protein powder but mine is vegan. It is not completely brown rice protein powder. It’s made up of pea protein, alfalfa protein, and rice protein (listed in that order on the nutritional info). Do you think that will be ok or will it also be mush if rice protein is lower down on the list (individual proportions of each type of protein are not listed). I’m ready to make these but just need that bit of information so I don’t ruin perfectly good ingredients! TIA! Does soy protein powder work? Hi, just wondering if the Soy protein worked for you? Hi – I just made these and I have some questions/comments. I’ve never used brown rice protein before – this might be a dumb question, but are all brands brown? The reason I ask is my mixture did not turn out the vibrant green as in your pictures. The mixture is more brown and green. I’m going to still eat them, but I really want that vibrant green that’s in your pictures. I also didn’t use the same brand as you recommended. Consequently there was no scoop in my container so I used the one from my whey protein. Suffice to say that all scoops are not the same. I think I estimated as close as I could but I think I ended up too high on the brown rice protein content. Which could have been part of my problem, but I don’t think it was so much more that it would have gotten me closer to that vibrant green. At any rate, I’m gonna give this another shot after I eat these and perhaps tone down the brown rice protein and maybe try almond flour, which has more protein than oat flour. 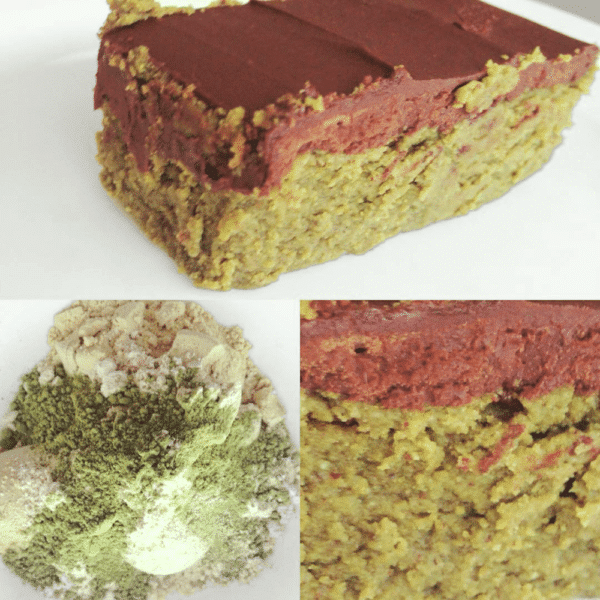 Your bars may have turned brown because of your matcha powder. Expensive matcha powder is a vibrant green, while some cheaper matchas tend to turn a mucky brown. I used to buy the cheaper matcha variety, but I quickly learned that it gave off the worst color 🙁 … so now I only buy the high quality stuff. If you get a chance to make the recipe again, I hope it turns out better than the first batch! What would you recommend doing with it? Try with the freezer? Bake it? Eat with a spoon? Hi! These were too tempting to not try! Unfortunately, after following everything step by step, they were a gooey mess. I guess I’m just not ever going to be good at baking :(. I’ll throw them in the freezer and see how they do then. Thanks for the recipe! I don’t have much experience with unflavored protein powder, but I do know that SunWarrior’s version is unsweetened as well… so if you use an unflavored/unsweetened protein powder you’ll need to increase the amount of sweetener, vanilla and chocolate as well. No! I did everything I was supposed to 🙁 I’m going to try again today, maybe less drops of almond oil or I did a false measurement of the, I believe it i was, oh yeah it was the protein powder. hrm ill let you know how this batch comes out. Hi ! This looks really delicious. 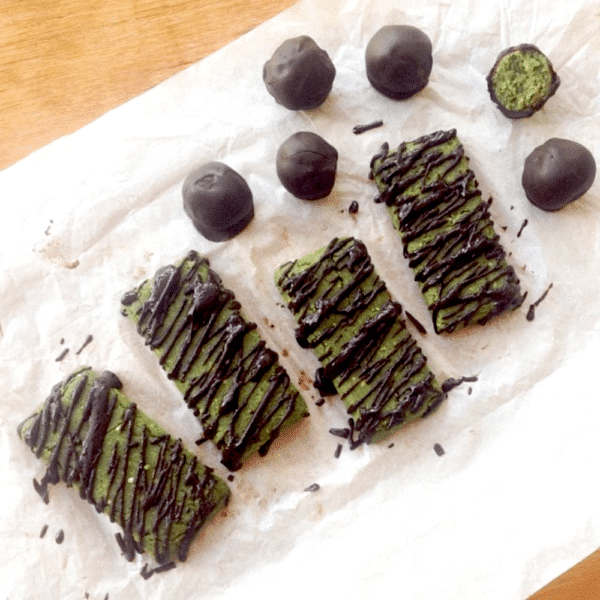 As I love matcha I can’t wait to try this receipe ! I have plant based protein with vanilla falvor at home (vega) do you think it will work ? I haven’t tried using Vega protein powder in this recipe, but from my experience with that protein powder, it probably won’t work because it absorbs so much liquid. Sorry! Super excited to try these out, I’m going to be using Soy protein so I’m hoping it works out! as for the sweetened, nowhere around me carries it, so I’m going to use sugar in its place, I like my matcha on the more bitter side. hoping when i adjust to my tastes they still work! Hi I tried making this without any protein powder and it was just a liquid mess in the end. Is there anywhere to make this a fudge bar without the protein and still have the batter like cookie dough? These look wonderful! I’ve never tried cooking with a non-whey protein powder before, so I’m not certain how different types would work with the recipe. I have some Spirutein, which is a mixture of rice, pea, and soy protein powder. Do you think that might work to give this recipe the body it needs? As for the Spirutein substitute, I’m not sure if that will work… I’ve never used it before. But, I guess it’s worth a shot? I would assume it would work since it’s got rice protein, and pea and soy seem like they would have similar absorption capabilities. I want to send these to my boyfriend in VA. I live in CA. Will these ship or do they need to be refridgerated ? Maybe this is a silly question! These bars do need to be refrigerated, but I suppose if you freeze them and overnight ship them with ice packs, they should be fine. Or, if shipping will take a few days, you can look into packaging with dry ice (I’ve ordered ice cream online before and it came in this cool box safe for dry ice, so I’m saving it for a time such as this). Great post, Jessica! I absolutely LOVE this recipe! I really like your recipe! Do you bake these bars after mixing together? Or are they to be put just in fridge? I’d love to try Chubby Hubby first, but they all look great. I read before that you give a price per bar breakdown in your book, could you do that on your blog too? I can see where that would be tedious, because of that I did was make a spreadsheet of things I bought at the price and size and then made it to calculate the cost by how much I used in the recipe. I guess I’ll just have to buy the book and see 🙂 . Even if it is more expensive, which I doubt, you can’t buy your flavors and make them to the size of your preferred calorie choice. Both of your books look great but I think I will start with the Protein Bar book. Do you have a recipe for Belgium Waffles? What type of protein do you think would work best for a nice fluffy waffle? Gah! Break out the champagne! You did it! At your age, with two published cookbooks is SO AWESOME. Never ever forget that. You’re a dessert genius, and now a protein bar genius. Girl, you know I’d want in on that birthday cake protein bar action. This recipe sounds delicious! I love matcha! ps. BIG Congrats on revamping your 1st cookbook! I just recently discovered proteinbars but love their versatility and deliciousness! 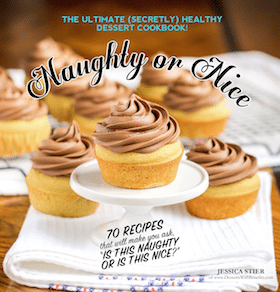 I just recently purchased your “Naughty or Nice” cookbook,(which I absolutely LOVE) and have been following you along on Instagram and Snapchat excitedly awaiting this remake of the protein bars cookbook!!! So excited for you!!!! Thank you for continuing to post recipes here on the blog as well!! I have tried a countless number, and can totally tell all the hard work and many trials you put into your recipes!! Good luck with this new edition! I’d try the s’mores! So obsessed with s’mores flavoured foods right now! These look delicious! I can’t wait to see all the new pictures in the second edition cookbook! 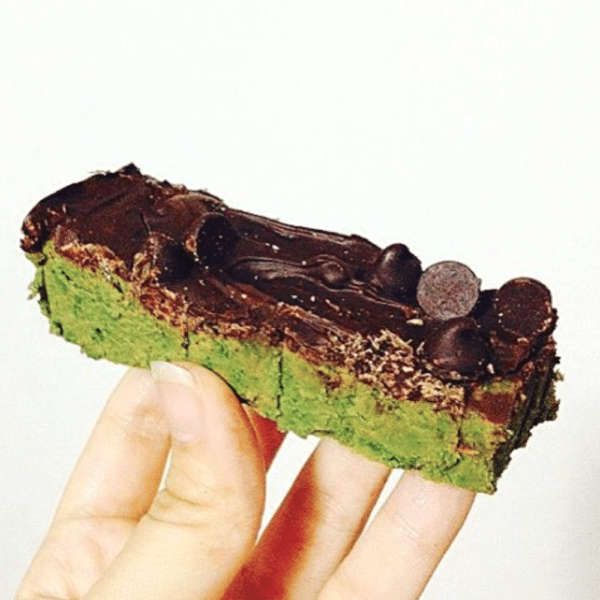 I’ve never baked with matcha before! How exciting! These look awesome! Buying protein bars can get so expensive so I’m looking forward to getting your cookbook and making my own in bulk.